Henry Winston Allen was a writer of many names. 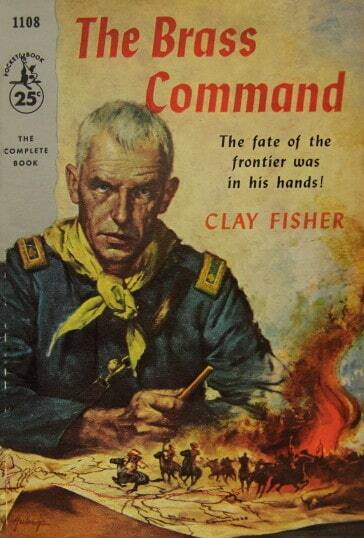 As the author of more than fifty books about the American West, he used the pseudonyms Will Henry and Clay Fisher, and was a five-time winner of The Western Writers of America “Spur” award. As a screenwriter, he used the names Heck Allen and Henry Allen, and was a long-time collaborator of animator Tex Avery, the creator of Bugs Bunny, Daffy Duck, and Porky Pig. Before becoming a full-time writer, Allen worked as a stablehand, shop clerk, and gold miner…all of which must have offered pretty good research opportunities for Western subject matter. The Hulings cover illustration for this Pocketbook edition of The Brass Command shows a no-nonsense situation in an interesting way. The Colonel here is most likely Joseph J. Reynolds, who was a key player in the Battle of Powder River in 1876. Here he’s wearing the signature yellow scarf of the cavalry. He is seated at a desk, holding a pencil, studying a map that is alive, in motion, and buckling under the action: you can see the Hulings signature underneath it on the bottom left. The map is on fire, with warriors thundering across it on horseback, and yellow smoke pouring up into the top of the frame. The battle was an attack on the Montana Cheyenne and Sioux, who were led by many of the famous aboriginal military leaders of those communities including Two Moon and Little Wolf. An ill-advised assault, it resulted in the cavalry’s defeat, and Reynolds being court-martialed and suspended from the military. This book was reissued with new covers in later editions, but as the first one, this 1955 Hulings version is the classic. You can easily get ahold of this edition online. The originals of Hulings’ commercial illustrations do pop up from time to time as well, although many of them may still be in the basements of publishing companies’ archives. If you know the whereabouts of this one, drop us a line.